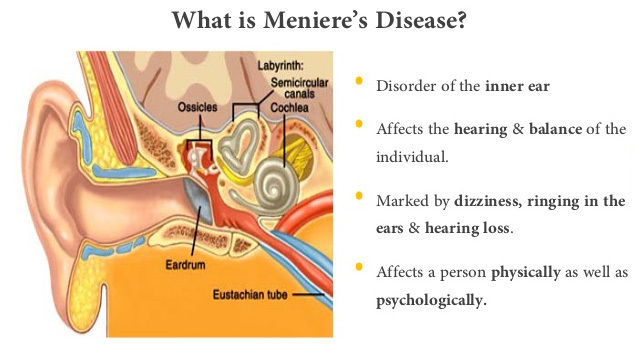 Meniere’s disease is a non-purulent disorder of the inner ear, which causes poor hearing. 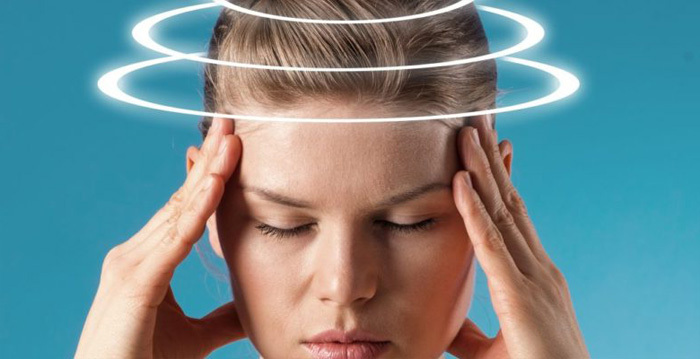 Loss of hearing results from a buildup of the labyrinth fluid followed by increased pressure inside the labyrinth, recurring vertigo attacks, loss of balance, ringing in the ears, nausea, vomiting, and other vegetative disorders. Meniere’s disease was first described in 1861 by Prosper Meniere, a French doctor, based on his 14-year-long observations. Thus, the disease does not belong to the group of “young” ones. In most cases, it is unilateral. The risk of bilateral damage does not exceed 15%. Mostly, it occurs in people 20 to 50 years of age, although it does affect children at times. People engaged in intellectual work and residents of large cities are a little more likely to develop it. The metabolic theory refers to poor metabolism of potassium in the affected area, which results in a localized potassium poisoning. The condition affects the hearing organs and the vestibular system. Other causes include generalized or localized endocrine disorders, improper nutrition, which causes fluid-and-electrolyte imbalance (for example, resulting from high intake of salt). The vascular theory views vascular diseases as the main causes of Meniere’s disease. This theory is justified by a large number of Meniere patients suffering different types of migraine. The immunological theory considers the relationship between Meniere’s syndrome/disease and immune disorders proved. Besides, the correlation between viral diseases and the risk of developing Meniere’s disease is scientifically proved too. The genetic theory appeared more than 50 years ago. It regards the disease as hereditary and caused by genetic changes, particularly those affecting the DFNA9 region of the COCH gene. The allergic theory relies on statistics, which shows that there are three times as many allergic people among Meniere patients as there are among the rest of the population. The anatomic theory: in this case the possible causes of the disease include structural characteristics and abnormalities of the inner ear, both inherited and acquired (caused by an illness or injury). In fact, scientists tend to consider Meniere’s disease to be one that is caused by a number of factors (polyetiologic). hearing loss getting progressively worse. The disease manifests itself in the form of attacks, and no symptoms occur between them. An attack may last several minutes to several days. In between, there may be no manifestations (at early stages). However, as the disease progresses, hearing problems begin to occur between attacks as well. Lightheadedness and vertigo are common signs, and they can cause serious imbalance, migraine, vegetative symptoms, blood pressure changes and swelling. Severe vertigo attacks force patients to lay down on one of the sides (the affected one). Meniere’s syndrome deserves a special mention. It also occurs in the form of attacks, except it causes the first three symptoms only. It does not cause hearing loss or ringing in the ears. It can occur due to a spasm of the labyrinthine artery, poor cerebral circulation, injuries (particularly cranial), and individual vestibular characteristics. Primary diagnostics implies differentiation between Meniere’s syndrome and Meniere’s disease and exclusion of other deceases (labyrinthitis, otitis, otosclerosis, cranial nerve tumors). Should attacks be followed by hearing loss, Meniere’s disease is diagnosed. The condition may start either with vestibular or sensory symptoms. The former include dizziness, poor coordination, vertigo; the former – ringing/buzzing in the ears, hearing loss, etc. It should be noted that the disease tends to progress in a step-by-step pattern. During the first two or three years patients may completely regain hearing between attacks. It is after five to seven years that hearing deteriorates even when all other symptoms are gone. Finally, patients lose hearing completely (on one or both sides). Vertigo is the main symptom, and it is often accompanied by nausea and vomiting. Some patients have pale skin and sweating. Usually, vertigo is preceded by a sensation of pressure in the affected ear or in the respective half of the head, which lasts from 20 minutes to several hours. No hearing impairment is observed between attacks. Patients tend to develop low-frequency hearing loss. Fits of vertigo reach maximum intensity and then their severity begins to decrease. Progressive hearing impairment resulting in bilateral deafness. Vertigo diminishes and finally disappears. However, some patients still have poor coordination, especially in dark places. Other causes of hearing loss are ruled out. The diagnostics of classic Meniere’s disease should be based on typical clinical signs and data received during an audiologic evaluation. What makes it difficult to diagnose is patients’ inability to clearly describe symptoms, which start with vertigo attacks. Treatment should be outlined by a qualified physician. Lack of universal opinion of what causes the disease makes complex therapy empiric in a certain way. The main goal of the therapy is reducing symptoms (mostly vertigo and vomiting) and slowing down the progress of deafness. Treatment requires complete rest and quietness. Drugs are administered orally, intravenously or intramuscularly (for example, in case of severe and unstoppable vomiting). In hard cases, a surgery may be required. Doctors recommend reflexotherapy (acupuncture, H-Wave electrotherapy, cautery) and vestibular rehabilitation for patients dealing with Meniere’s disease and Meniere’s syndrome. Although Meniere’s disease is not lethal, it seriously impairs the quality of life. Particularly, it may result in a disability status and professional restrictions (working in high places and spheres where acute hearing is a must is forbidden).